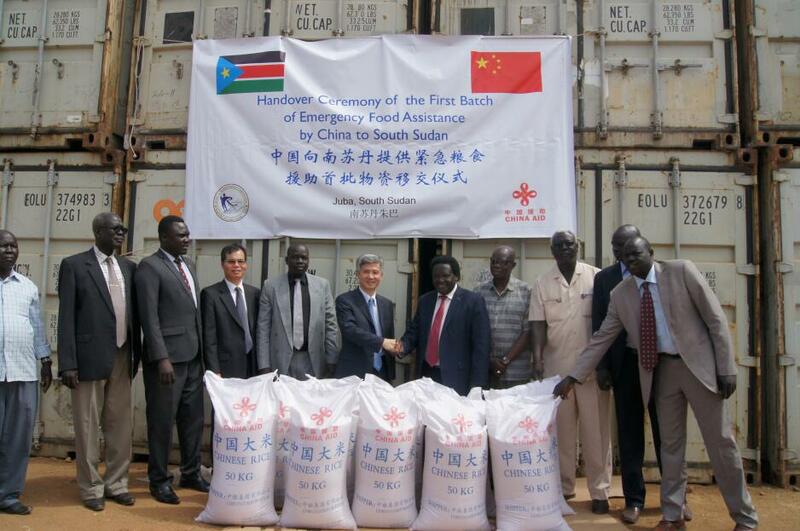 On February 21, 2019, the handover ceremony of the first batch of emergency food assistance by China to the South Sudan was held in Juba. H.E. He Xiangdong, Chinese Ambassador to South Sudan, Hon. Dr. Manase Lomole Waya, Chairperson of Relief and Rehabilitation Commission, Hon. Amb. Samuel Luate Lomisuk of the Ministry of Foreign Affairs and International Cooperation of South Sudan, Mr. Cai Senming, Economic and Commercial Counsellor of the Chinese Embassy and senior officials from the Ministry of Foreign Affairs and International Cooperation and Relief and Rehabilitation Commission were present at the ceremony. At the meeting with President Salva Kiir on the sideline of FOCAC Beijing Summit in September last year, President Xi Jinping announced that the Chinese Government will provide South Sudan with emergency humanitarian aid worth 100 million RMB Yuan, which will be used to supply rice to South Sudan. The 1,000 metric tons of rice is the first batch of the total 9,660 tons pledged. Since December 2013, China has been continuously providing humanitarian assistance every year to South Sudan. China will continue, within its capacity, providing strong support to South Sudan in humanitarian aid, nation-building and social-economic development.